As Summer (hopefully) arrives my blogging is becoming increasingly erratic. What is to blame? A combination of selfish friends having children & getting married, my birthday and a packed schedule in the day job. That said there are some exciting happenings and openings across Nottingham. The Herbet Kilpin is a new venue from the team behind Boilermaker and Junkyard and is just a stone’s throw from the later. It is more rounded than the cocktail or craft beer focus that defines the other bars in the small chain. There also appears to be a bit more of a focus on food so I look forward to heading down. A Nottingham establishment was also featured in The Guardian. The Lace Market Hotel got a pretty good write-up particularly the Merchants restaurant and its young chef. I had a particularly bad meal here some years ago but the new owners seems to be getting things right so will be making a visit. If it is good it could breathe a little life into the mid/high level fine dining scene of Hart’s / World Service. My thoughts on this list are probably best left for another day but in general they have certainly recognised some good restaurants and venues in Nottingham. Having talked of my birthday the top billing of that weekend was the best restaurant in the country (according to The Times), Nottingham’s own Sat Bains. I have been a number of times but my last visit was just over a year ago and the menu had changed almost entirely. Amongst a procession of excellent, innovative food a couple of stunning dishes did stand out. 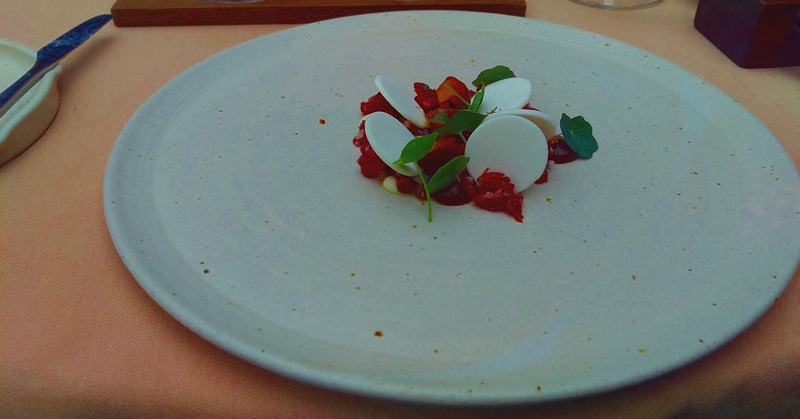 An aged beef tartar with raw and lightly sautéed mushrooms was seasoned with lichen. A perfect marriage of flavours and textures. Desserts aren’t usually a highlight of a meal for me, you’re not hearing from a man with a sweet tooth. That said I defy anyone not to enjoy at least one of the 3 desserts on the 10 course tasting menu here. All 3 did it for me, the best was a clever mix of 3 rice-based ingredients. The meat of the dish was a rice pudding that remained rich and creamy despite being lighter than I thought possible. On top of that was some puffed rice that bought a toasty texture to the dish, a freshness was finally added by a sake (rice wine) and apple granita. It might not be for everyone but if I am paying top money this is the sort of precise, skilful cooking that I want and rest assured that flavour is not compromised for technique here. Yes, enjoyed it but thought it was a little pricey. Will probably have to go back and try more as others are saying good things!